Finaly, the third volume from Team Hegdal is here (in some days). We are happy to share it with you! The CD will be released April 7th, and the LP will be around from June 2nd. Public hearing of Team Hegdal «Vol 3»! Saxophonist/composer Eirik Hegdal has been one of the major forces of the new wave of exiting jazz musicians coming out of Norway for the past 15 years. He is well known for his many projects with Trondheim Jazz Orchestra. Among the projects is the jazz orchestra featuring the great saxophonist Joshua Redman, playing compositions by Hegdal. Team Hegdal is Hegdal’s laboratory for smaller ensembles. On this third release from the quartet, the swedish piano comet, Oscar Grönberg, guests. This is great musicians, playing great compositions! The titles for «Vol 3» leaves a certain hint of inspiration from the American jazz pianist Thelonius Monk. «More Monk Measurements,” “State of Monk”, and a mix of Monk and the island community outside Trondheim/Norway in the song «Monkholmen”. A Team of undisputed jazz trotters will guide you through nine customized compositions, released both on CD and LP. 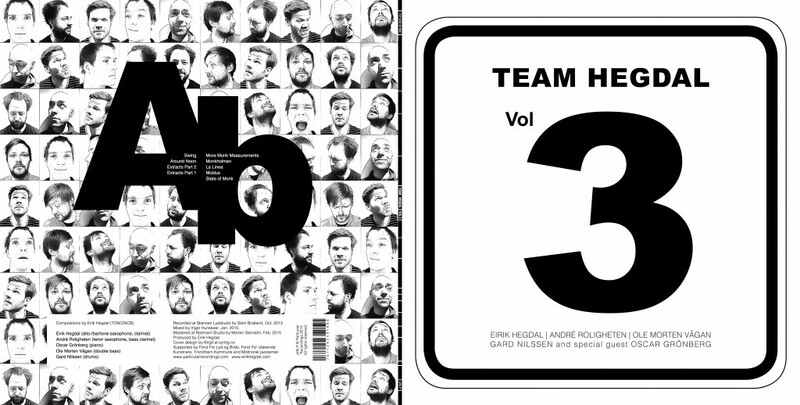 Team Hegdal’s «Vol 3» offers touching interaction and virtuoso individualism, from a bubbling tandem; Ole Morten Vågan (double bass) and Gard Nilssen (drums), two brothers in arms; André Roligheten and Eirik Hegdal (saxophones and clarinets), and a Swedish piano hero; Oscar Grönberg. This is an apolitical public hearing. The musical confrontations and mergers on this album can also be experienced on stages around. Bring out your ears!